While hiking the trail along the rim of Kilauea Iki volcano crater on the Big Island of Hawaii last July, we came across a dazzling beauty of a plant. It had multiple tiers of yellow flowers off a single central stem. As we neared the end of the trail, we came across knobby growth covering large areas of the floor of the tropical forest. We stopped a passing park ranger to ask what it was. 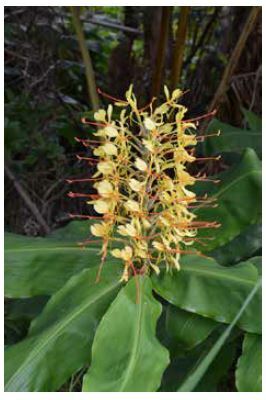 She explained that these were one and the same plant—Kahili Ginger (Hedychium gardnerianum). It is native to the Himalayan area, and brought to the Hawaiian Islands in the nineteenth century for its ornamental value—its root is not edible. This beautiful plant is the second-most invasive plant on Hawaii—Faya Bush or Fire Tree (Morella faya) tops the list. Kahili Ginger grows very quickly and chokes out the understory native vegetation, including trees—much like Illinois' bush honeysuckle! The park service is battling the plant by cutting it close to ground level and treating it with herbicide, followed by continued trimming of the regrowth that eventually kills the plant—a very labor intensive effort.